I LOVE This Smart Sprinkler System! You know me.. I LOVE connected home stuff. Anything to make my life simpler! So, it’s only natural that I would have a smart sprinkler system, too, right? 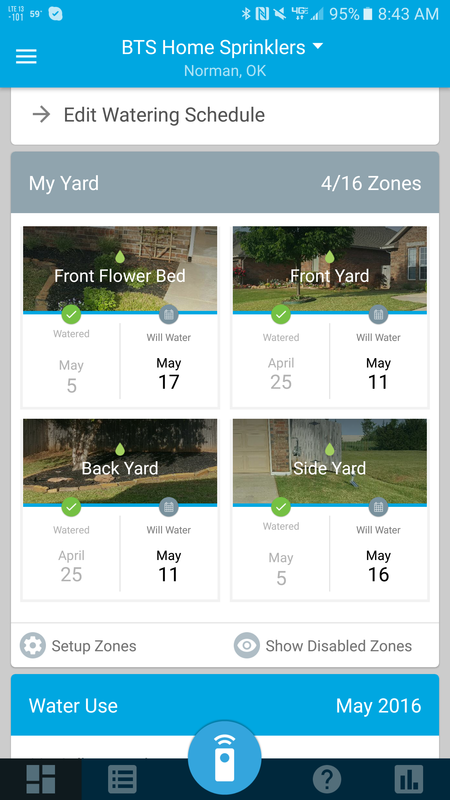 Yep, I use a Rachio smart sprinkler system. My particular version can control up to 16 different zones! It takes into account a ton of factors for each different zone to optimize watering.. Soil type, sun, current and forecast weather, slope, what type of sprayer is in that zone, etc! Rachio also ties into IFTTT, so controlling it with other things, triggering in different ways, even voice controlling via Amazon Echo is all possible! What is really cool is that I can use my Netatmo home weather station to tie into the weather part of the sprinklers. Now, if you don’t have this, don’t worry, it will use the nearest approved weather sensor, like NWS, etc. This takes into account not only the current conditions, but the forecast, so it can optimize the schedule of watering! For example, if it rains, it will put the system on a rain delay.. No need to run if it’s raining! If it’s going to freeze, it won’t run, etc! We’ve had a lot of rain lately so you can see some decent gaps in between the waterings. Of course you can manually control everything too! You can select a duration and run each of your zones as you wish. ← Insane Twin Tornadoes in Iraq!